My palms are wet, but I am not nervous—just uncontrollably excited to be talking with Claudio Roditi, an iconic figure in music. With Brasilian guitarist, Ricardo Silveira and percussionist Duduka da Fonseca, another Brasilian and long-time resident of the Big Apple, Roditi is a seminal figure in the pursuit of a rare idiom in music. Some call it Samba Jazz. If that was meant to conjure images similar to Latin Jazz it certainly goes a long way in to putting the sound into a rather straight jacketed perspective. What would be more appropriate should have been a term like Afro-Cuban music. That term has color and suggests a whole palette of sounds. Musica Brasileira- Jazz somehow does it better. It suggests a complete setting; the feelings and emotions of saudade and alegria that are at the heart of and course through the music called choro and disappear under the surface of the broad palette of sounds—not just rhythms—but sounds and silence of both urban and pastoral Brasil. 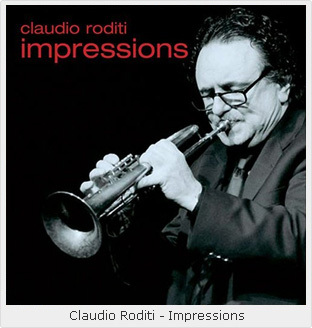 This really is what Claudio Roditi brought to the idiom of jazz, melded it in, blending the shuffle of samba with the swagger of swing, pouring in molten emotion from a heart and soul filled with music. It is what I saw when I went back to one of my favourite images of the musician. This appears on the film version of Dizzy Gillespie’s United Nations Orchestra, one of the last great big bands to grace our planet. This is the fabled performance of Dizzy’s great band at the Royal Festival Hall, London on June, 10, 1989. There are many occasions to gasp in wonder. One sticks in my memory: Dizzy kicks off the set with a rousing version of “Tin Tin Deo” and it is time for the formidable trumpet section to get into the act. The section comprises its leader, the great Dizzy himself, Arturo Sandoval, playing both trumpet and piccolo trumpet and Roditi. The next track is D’Rivera’s “Seresta” and Paquito holds court. His solo is timed for last, after Diz’s wild romp all over the horn, the voice cracking with characteristic Dizzyness and after Sandoval’s pyrotechnics on his trumpet. Roditi returned to solo on “A Night in Tunisia.” Here he captures not only the romance and magical mystery of the North African destination, but also its complex rhythms. It is easy for him. He is Brasilian, of course. Roditi also features prominently in the triangular conversation at the end of the song. This is what I hear in Claudio Roditi’s voice… peace, longing and joy. Nothing has changed since then. I expect that nothing will as I dial the number given me for his home in New Jersey. The phone rings and a soft male voice says “Hello…” as if singing a song. “Claudio..?” I ask… “Yeah,” he answers, and now it’s his turn… “Raul? Contente encontr&#225-lo…” he continues. I ask to continue in English, always embarrassed by my watered down, Anglo Portuguese accent. He agrees. I feel I know his music better than I know him when I call, so my aim is to get to know him. What made him come to the United States and stay for so long? Most Brasilians do not. Their longing for Brasil is too much to keep them away from that country for too long. Their connection is umbilical and that chord is never cut. Something else is mystifying. I have just heard his new album and it is one full of his songs. I believe that he is a marvellous composer. He just does not know that. Either this or perhaps he does not think so himself. I want to know more about this and as it relates to his album, Simpatico I hope that we’ll talk about that too. And of course I will ask about Brazilliance x 4. That is an album that gets regular airplay at my house. The groove is hypnotic and exhilarating. I can hardly wait. I jump right in. “Well, Claudio, let me begin by asking you when you came to the United States and how did you decide to come here?” I ask. I let that go… perhaps I will bring it up later… and wait for him to continue. “As I was saying,” he continues, when I stop pontificating, “In 1966, I took a trip to Austria to attend a jazz camp and I ended up staying there for a year. This trip was one of the most meaningful for me. I got to play with some fine guys there. There were no restrictions… I was in heaven… I was playing trumpet there and then I met Art Farmer, a great guy and a great horn player. He was playing the much softer, flugelhorn and I loved the sound. It was then, with Art’s encouragement that I took up the flugelhorn. And so you did, irma&#245, I say to myself, so you did… And how! “You know,” he says suddenly, as if remembering something too important not to bring it up immediately and making a jump-cut in his own biopic in the bargain, “I have a unique career… You talked about my Brasilian-ness… well; I must be the only Brasilian musician to play with almost every kind of musician… You know what I am saying? “And Dizzy Gillespie,” I remind him. “Yes, Dizzy too… You know what, it is crazy these days. Even now people who do not really know me… But when they recognize me they say to me, ‘Hey! Aren’t you the guy who played with Dizzy Gillespie? I too find that quite amazing. Claudio Roditi has moved so far from there, even though he still plays in that Big Band, which gets together sometimes to play Dizzy’s repertoire. But Roditi has such a singular style. In fact he was recognized twice for it very publically. The first time was in 1995, for his solo work, Symphonic Bossa Nova with the Royal Philharmonic Orchestra and Ettore Stratta, which was nominated for a Grammy that year. The second came in 2009 when Brazilliance x4 (Resonance Records, 2009) was nominated again. In this music, which is far from the mainstream pop and hip-hop music, to be nominated is recognition enough. The rest is politics. George Klabin’s record label offers a new musical home for Claudio Roditi. Klabin is a great patron. You can tell, when Roditi speaks of him so fondly—as if Klabin knows exactly why. But here Roditi is going and always seems to be there, waiting for him. 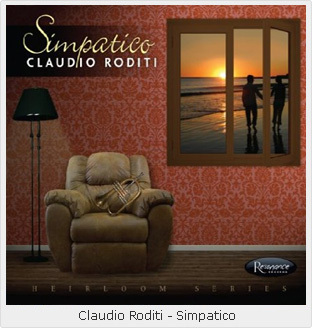 It is on the tip of my tongue to get to the second reason that I am talking with Claudio Roditi—Simpatico. But he beats me to it. He explains the difference between the two. “Brazilliance is different for me, for two reasons. First, you know, of course, that it is a ‘live’ record. We were playing this gig at Rising Jazz Stars, in Beverley Hills and Klabin went over the tapes sometime after that and realized that we had something there, so he brought us in to the studio to fill it out. I took Duduka (da Fonseca), pianist Helio Alves, and bassist Leonardo Cioglia into the studio and recorded other tracks. In the end, we settled on what you hear on the album, but essentially it came about because of that gig. Of course I do… But to hear him say it somehow is a startling admission. I wonder then if he suppresses his urges to compose, especially when the ideas start to come fast and furious at times. Simpatico has a softer ring to it than his previous production, Brazilliance x4. The title is an evocative one. Roditi is listening to his inner voice here. And he is giving in to its desires and its notions. It is a voice with secret chords and changes that speaks to the soul. To listen is to hear treat the matters of the heart with sympathy and let unbridled desire flow. This perhaps is how the music first happens. Then the hard work of polishing the songs begins. With Claudio Roditi it did not matter… he has had all the time in the world. Part of the polished nature of the album is the players Roditi has surrounded himself with. Pianist Helio Alves and percussion colorist, Duduka da Fonseca are regular band mates. 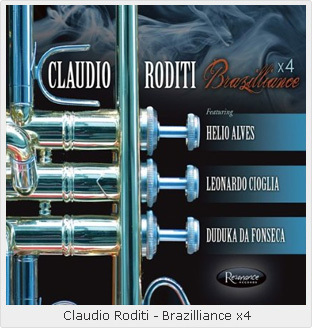 Both musicians, like Roditi, are Brasilian, but long time residents of the United States, as comfortable in the jazz idiom as they are creating oceans of sound in Musica Brasileira, the idiom that Roditi helped shape. They also understand perfectly how to get involved in the musical tapestry that Roditi weaves softly around him and are virtuoso players in their own right. To add another damper to the mix, Roditi hosts Michael Dease, a young trombonist who plays brilliantly throughout, adding a touch of class in his contrapuntal playing and reading of Roditi’s playing. Romero Lubambo has long been fancied as an inheritor of the majestic spot left vacant by Laurindo Almeida. A guitarist with a deft touch and very expressive intonation and dynamic, Lubambo brings an air of grace to complement the pianism of Helio Alves. John Lee, occupying the bass chair, in place of Leonardo Cioglia, is an old friend and band mate from Dizzy’s United Nations Orchestra. Roditi had played with Zé Luiz Maia, another electric bassist from Brasil, years earlier and somehow, Lee fits the slot quite well, as Maia would have, had he been there for the asking. Roditi and Lee develop a wonderful understanding throughout and the bassist solos on “Slow Fire” using a tremolo that feels like a con arco stretch. Roditi’s compositions reveal a startling warmth about the composer’s nature. In a sense this is reminiscent of Jobim and Johnny Alf, the latter happens to be a particular favourite of Roditi. Alf never got the recognition he deserved and was writing music in the Bossa Nova mode long before it became standard to call it so. But being a self-effacing musician, he continues to live and write in relative anonymity in Brasil. Roditi champions his cause yet again with an elegiac ballad, “Alfitude” honouring his long time friend. The song has a find inside-out melody that twists and winds in a downward spiral with Roditi and Dease playing counterpoint in the first chorus, before Roditi stretches, squeezing out notes that speak of the silent admiration he has for Alf and the anguish at his being ignored before Dease returns to solo with compassionate grace, followed by a beautiful break by Alves. 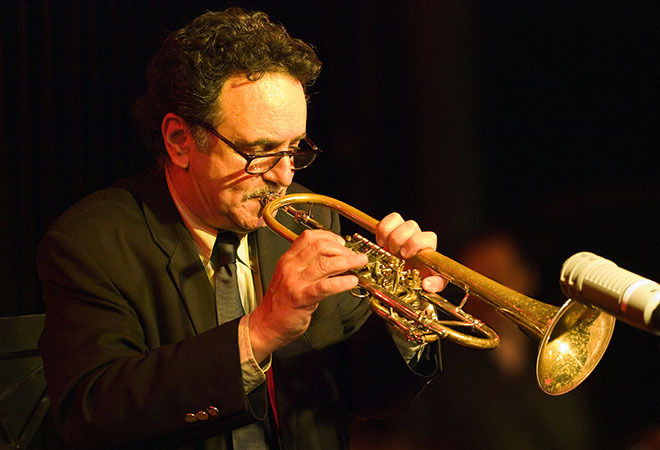 On “Piccolo Blues” Roditi plays the little trumpet with such dexterity, making it appear so easy to play. In reality it is notoriously difficult to play. Nevertheless, Roditi shows his mastery of it with a fiery opening theme that plays homage to the blues idiom as well. An old friend, Kuno Schmid, orchestrates “Slow Fire” and Roditi is back on familiar ground, playing behind and ahead of strings again as he did on his first Grammy nominated album, Symphonic Bossa Nova. Roditi’s playing burns with a bright blue flame here as does John Lee’s. “How Intensitive” is an oblique Bossa Nova tribute to Jobim and even features a sly quote from Jobim’s own, “How Insensitive.” There is unmistakable romantic side to Claudio Roditi and this manifests itself in his elegiac charts, all ballads in honour of his wife of many years, “A Dream for Kristen.” Then there is the homage to his parents, “Alberto and Daisy” a blues for a friend, “Blues for Ronni” and a magical tribute to a friend’s daughter, “Waltz for Joana.” This last song features a vocal by Roditi that shows him to be a singer with perfect pitch on this deceptively simple melody. It bodes well for more vocal work in future as Roditi joins the ranks of Chet Baker as a master of the ballad, singing unlike Baker in a husky and captivating tenor with warmth and regal splendour. I ask Roditi how easy it was to make this album. “Not very,” he answers, “But I was made comfortable by George Klabin’s confidence and support,” he adds. “I was also happy to be back in the studio with Helio, Duduka, Romero, John and Michael. And Kuno is fantastic when he gets going. George and he have a tremendous rapport. “So in the end it became a very rewarding project. I suppose I had to get it out of my system… composing I mean,” he says with a bright laugh. Would he do it again? Somehow I want to hear him say, “In a heartbeat.” But Claudio Roditi being Claudio Roditi he says with a barely perceptible shrug, “I don’t really know… I want to play so I guess that means no composing for a awhile.” How about gathering some older charts and reworking them for a big band, or doing them in symphonic form, I ask. “Who knows,” he says sounding as if he is considering the prospect. 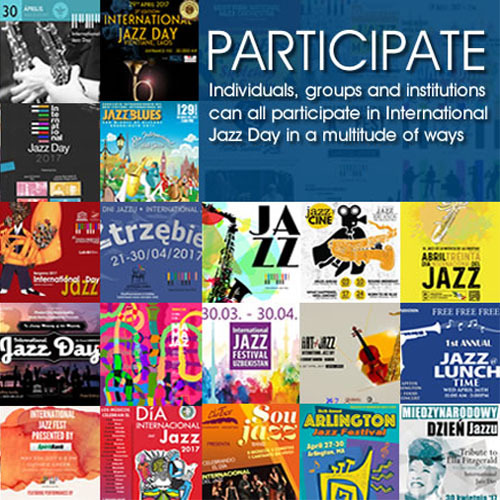 And there is that commitment to play Musica Brasileira-Jazz… Like the rest of his fans around the world and in Brasil, I can only wait with bated breath.